On November 12th, an employee of the Ryman Auditorium’s recently-opened CafÃ© Lula named Kimber Engstrom was fired after she attempted to set up a prayer vigil in the historic concert venue for the ailing Joey Feek of the singing duo Joey + Rory. Engstrom wanted to conduct the prayer vigil for November 19th when the Ryman was vacant, even going as far as to create a poster for the event (though she says she never printed any), and setting up a Go Fund Me account to raise the $18,000 fee the Ryman was charging to rent the facility. However the famous “Country Music Mother Church” didn’t look kindly on its name being used without prior permission, and terminated Engstrom from her position. Now Ryman management is saying they were too harsh on Kimber Engstrom, and even offered to rehire her. Joey Feek of Joey + Rory was diagnosed with abdominal Cancer in 2014 and is currently in hospice care after receiving a terminal diagnosis in late October and deciding to cease treatment. The firing of Kimber Engstrom caused much concern on social media from fans wondering why the space had to be rented for such a high fee when the prayer vigil was not going to be a for-profit event, and the venue was not booked for the evening. However others think Engstrom was presumptuous to assume the Ryman would approve the event. On Monday (11-17) Ryman Management announced that the Grand Ole Opry show at the Ryman would conclude in a prayer vigil for Joey Feek at 9:30 p.m. Central. Charlie Daniels and other stars that performed on the evening participated in the event. There was also a prayer night held at the Blue Bar in Nashville on Nov. 21st, organized by Kimber Engstrom. There’s also an effort underway to get the Joey + Rory song “When I’m Gone” to #1 on iTunes by purchasing the song. Kimber Engstrom provided a statement to Saving Country Music about the situation with the Ryman. It all started Oct 26, 2015, the day after I heard Joey Feek was stopping cancer treatments. I was with my best friend Bernie, at his log house, about 35 minutes outside of Nashville, and he said to me, “I love it when you pray for me, will you pray for me now?” So I held his head in my hands, and I prayed. After we finished , I said “I wish we could all come together in Nashville and pray for Joey.” Next thing I know, Bernie made a Facebook post inquiring if others would want to do the same… and a fire began to burn in my belly. 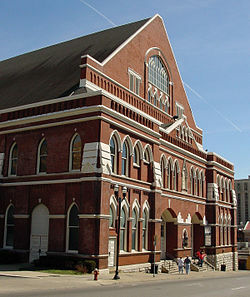 I am 3 years new to this magical town of Nashville, and was 3 weeks new to the magical Mother Church, called the Ryman. While working inside its Cafe Lula, I would do whatever I could to get inside the Ryman building so to feel the atmosphere…. an atmosphere so thick and heavily drenched in the roots of true country music… and faith. Adding those things together, it only seemed right the answer to the fire in my belly was have a gathering of faith, prayer and love inside this magical building, the Ryman… Of course in Joey’s honor. After all, Joey Feek is what the Ryman stands for , true country music … and faith. In my heart, I saw a night where Joey was honored, lifted up and loved on…. and as she was built up, I was hoping we all could be built up. I reached out to Bill Gather in hopes he could champion this night. Her short tenure probably played a role in the “hasty” decision. Yeah probably not too smart to be doing this kind of thing after only three weeks on the job no matter how well meaning you are and worthy the cause. If she took her job back that would most likely end her lawsuit she mentioned she was going to file, if I remember correctly from the last one. Oh yeah. “Please take your job back and go away.”. The Rymam is scrambling. Did George Jones family pay to have his funeral there?